Volamena Proactive Vitamin-C Skin Serum contains a higher concentration of active molecules, making them an essential product in your daily skincare routine. Their sheer, fluid textures ensure that the active ingredients are rapidly absorbed and sink into the skin effortlessly. 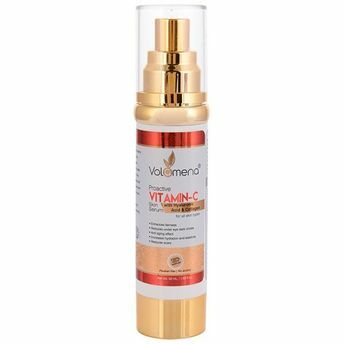 The volamena Proactive Vitamin-C serum has a revolutionary formula. This miraculous serum contains more than 10 active ingredients. It is extremely effective in reducing the hyperpigmentation on face and visually increases the fairness of skin. It provides uniform skin tone by reducing the appearance of uneven areas and dark spots. Volamena proactive Vitamin-C serum contains a higher concentration of active molecules like Vitamin-C, hyaluronic acid, hydrolyzed collagen and passion fruit oil which visually increase the whiteness of skin and reduces skin hyperpigmentation. It diminishes dullness and reduces appearance of fine lines, wrinkles, and discoloration that shows even skin tone and texture for younger-looking skin in as little as 4 weeks.